Android Wear and Apple Watch may have the headlines, but they're not the only two smartwatch players in town. Back before either showed up to the party, a small team broke Kickstarter records to create an intelligent wristwatch with an e-ink display. A few years later, they did it again, except this time, in color. That second campaign gave rise to the Pebble Time, an updated model with an improved, colorful screen and a smarter interface. The watch has an MSRP of $199.99, but the general street price is closer to $150. Still, you might want to turn your eye toward Groupon. 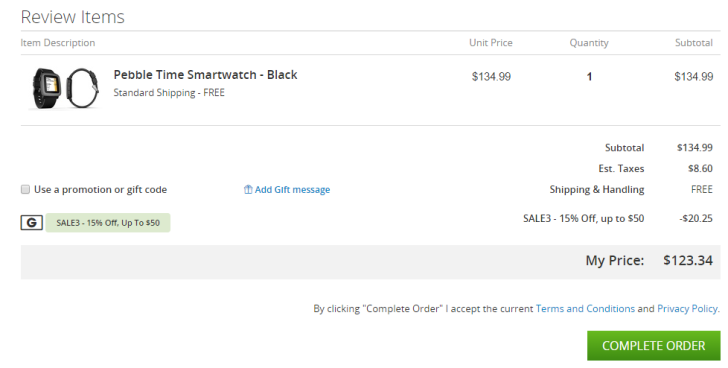 There the watch is going for $134.99. The discount doesn't stop there. If you use the coupon code SALE3, you can take an additional 15% off. Plus shipping is free. You have fourteen days left to take advantage of the offer, so if you're in the market for a smartwatch but aren't sold on Android Wear, this is a good time to get your toes wet on an alternative.